On Wednesday My AFD box arrived here is the list of contents. My self imposed challenge is to use or preserve this box contents over the next fortnight. 21 18 Apples ( various varieties ). and a fussy family to consider. Made an Apple custard tart for desert last night, used 3 Apples - Every bit as good as it looks! Biggest 'get them to eat it' Challenge ingredients on this list are Eggplant, Cabbage and Sweet potato. I introduced Sweet Potato as Chips - worked OK would say mild success. Chunky Potato and Bacon Soup. Sweet Potato and Bacon Slice. Would you like my (real) onion soup recipe T? Event he two year old in my house loves it!! Your list of things to try looks delicious...does using mean cooking storing too? Have fun with it, it would be gone in under a week in my house!! Hi Tammy, I've had great success with Greek Eggplant fritters (Melitzanokeftedes) with my lot (except my 6yo girl - she's a work in progress). I love thinking up ways to use up ingredients. Sing out if you need a hand! Only too happy to help. I hate when I let the veggies spoil - in fact you've reminding me that the crisper bins in the fridge probably need a thorough cleaning. i've give eggplant fritters a vote too - or even eggplant dip - yum! as for the cabbage - i shred it finely and add to fried rice or noodles - hey, it even sort of looks like noodles! good luck with all your fresh (and not so fresh) ingredients. i wish we had a service like that here. What about some stewed apple to use up some of those apples? And maybe some apple-pear crumble? You could make a salsa with the tomatoes and onions. Tammy i love roasted eggplant, its yum. Its also nice cooked with tomato, onions and garlic. Goodluck with using all those onions, how about an onion jam? The chook cage is progressing well, thanks Tammy! I can only do a little each night as my arms and the drill both run out of puff, but I am getting there. Good Luck with your challenge! 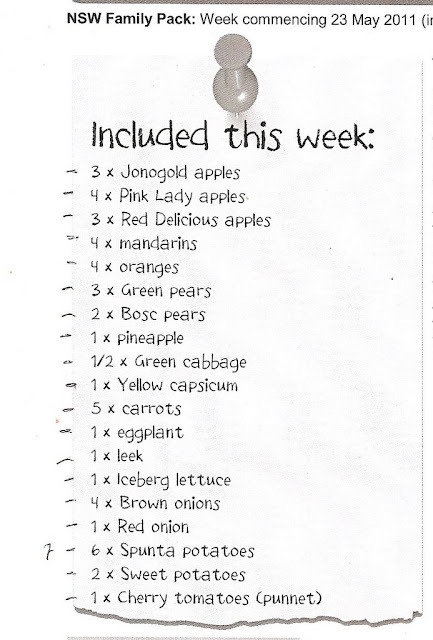 I love our AFD fruit & Vege box and have some of the same challenges with an abundance of one or two items. At the moment I have a lot of apples as well. I have stewed and then pureed mine to freeze. With a baby apple sauce is always good to mix into foods.